Fluorescence microscopy has become a valuable tool for imaging in research, education, and for trouble-shooting in industry. Its applications have spread across the life, materials, and forensic sciences as well as geology, chemistry, and semiconductors. To help young faculty members in these areas set up their first labs, NIGHTSEA, providers of the Stereo Microscope Fluorescence Adapter (SFA), are again partnering with well-known accessories supplier, EMS-Diatome, to offer the KEY Award: an equipment grant of a NIGHTSEA SFA with two excitation/emission combinations plus $750 in equipment or supplies selected from the full EMS catalog. 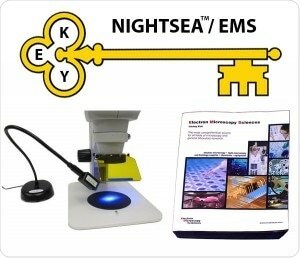 The 4rd annual KEY Award will grant a researcher setting up their first lab a NIGHTSEA Stereo Microscope Fluorescence adapter system as well as $750 in equipment or supplies from EMS. The KEY Award is our way of acknowledging the impact of my own mentors and of giving back to the scientific community. While past KEY awards have been limited primarily to new faculty in the Life Sciences here in the United States, the 2018 KEY Award will expand to include new faculty using fluorescence stereo microscopy in any discipline, world-wide. Applications are open to individuals entering their first faculty position at a non-profit college or university in calendar year 2018. The deadline for application is June 1 with the winner being announced in early August. Equipment will be sent to the awardee at their new institution. Last year’s winner, Dr. Kristen Gorman, Assistant Professor at California State University/Chico, uses her NIGHTSEA system for research on idiopathic scoliosis (IS), a pediatric spinal deformity that affects as much as 10% of the global population. She uses a small fish, the medaka, to map the genetic loci causing spinal curvature. ‘E’: Dr. Harold E. ‘Doc’ Edgerton of MIT and Dr. Thomas Eisner of Cornell University. ‘Y’: The husband and wife team of Drs. Charlie and Clarice Yentsch.